You could win a $200 Fairview Garden Center Gift Card! Create your own, custom container garden using plants purchased at Fairview Garden Center. Take a picture of your container garden once completed or filled-in and post to the Fairview Garden Center Facebook Page or email to news@fairviewgardencenter.com. Share your photo and encourage your friends to “Like” YOUR container garden on the Fairview Garden Center Facebook Page OR “Pin” your photo from the Fairview Garden Center Pinterest Page. The Top 5 Container Garden Photos with the most “social activity” (Likes and Pins) will be asked to either bring their containers or a photo of their container to display at our Summer Flower Open House on June 8, 2013. 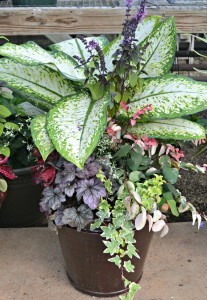 Customers will vote for their favorite container during the Summer Flower Open House (in store) and the winner of the $200 Gift Card will be announced at 5pm on Saturday, June 8, 2013 based on the number of in-store votes. Participants: Please be sure to email your submission photo and contact information to news@fairviewgardencenter.com.